The first compositions that were to bring Chopin outright success were the Nocturnes and Waltzes. Whilst the latter’s foot-tapping appeal is understandably direct in terms of salon audiences, the Nocturnes pursue a more varied course. The title of these ‘night pieces’ was adopted from the works of the Irish composer-pianist John Field (1782–1837). Whilst the Nocturnes of Chopin leave those of the Irishman far behind, the famous E flat Nocturne of Chopin’s Opus 9 is almost embarrassingly similar to one by Field in the same key. The Nocturnes are here recorded in chronological order of composition. Though published posthumously as ‘Opus 72’ the E minor Nocturne actually dates from 1827, when the composer was seventeen. As might be expected in so early an essay in the new form, the structure and invention is relatively simple compared to the grand inspirations which were to come. Another early work, published posthumously in 1875, the Nocturne in C sharp minor of 1830 is often known as the ‘Lento con Gran Espressione’ after Chopin’s tempo indications, though its early publishers variously titled it ‘Nocturne’ or ‘Reminiscence’. The piece was dedicated to Chopin’s sister. It opens with a passage of six chords repeated twice, after which the piece takes a simple A–B–A form. The first twenty bars consist of a typically Chopinesque cantabile melody over an arpeggiated accompaniment. The central section is interesting and unique in Chopin’s output in that its material is based on two works Chopin had just completed—the F minor Concerto and the song Zyczenie. This section exists in two versions in the sources. The first autograph has the Concerto quotations played by the right hand in their original 3/4 time signature at double the bar rate to the Nocturne’s 4/4 signature which continues in the left hand. This ‘avant-garde’ polyrhythmic practice was unheard of in Chopin’s day and in later copies he appears to have sanctioned a rhythmic simplification. However, in this recording it is the original which Lívia Rév plays. The work is concluded by a return to the opening material, though this time in a highly ornamented form. Chopin’s first three published Nocturnes, Opus 9, are dedicated to Madame Camille Pleyel and date from 1830/1. Camille Pleyel was a wealthy piano manufacturer who invited Chopin to accompany his wife, Marie-Félicité, and himself to London in 1837. They visited such tourist centres as Hampton Court and Richmond and also went to Brighton. It was Marie-Félicité who had the reputation of finding men irresistible and with whom Berlioz had at one time been in love. The English excursion was plagued by poor weather about which Chopin complained much, but he was most impressed by the wealth, space and trees that he observed. The first Opus 9 Nocturne, marked ‘Larghetto’, is a gracefully proportioned piece which immediately establishes the style of ornamented melodic writing that is such a feature of Chopin’s Nocturnes. The second of the group is in E flat major and has become one of the composer’s most famous miniatures, though its importance does not truly extend beyond the salon. The third Nocturne, in B major, is particularly note­worthy for the delicate ornamentation of its melody. It has a central Agitato section to contrast with its Andante outer paragraphs. The three Nocturnes which form Opus 15 honour Ferdinand Hiller (1811–1885) by their dedication. Hiller, a celebrated pianist, was a friend who introduced Chopin to Mendelssohn. The first of Opus 15 dates from 1830/1 and already reveals Chopin’s growing assurance and independence. Unusually, it bears a double time signature of 3/4 and 9/8 and is marked ‘Andante cantabile’ for its outer sections, and ‘con fuoco’ for its stormy middle section. 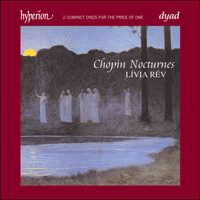 Chopin achieves a marvellously cool mood in the Andante sections, a considerable contrast to the voluptuous tenor of the succeeding F sharp major Nocturne composed at the same time. Here the perfumed salon atmosphere is recreated in the outer Larghetto sections which enclose a ‘doppio movimento’ of considerable passion. The last of the set dates from 1833 and is a strange piece containing a central chorale of extreme simplicity. It is in G minor and marked ‘Lento’. With the two Nocturnes of Opus 27 (1835) Chopin reached a new level of inspiration. They are dedicated to Madame la Comtesse d’Appony and the first, in C sharp minor, is marked ‘Larghetto’. Already in the third bar a major–minor equivocation sets the atmosphere of this delightfully mysterious piece, enhanced in its outer sections by a wide-ranging bass that adds to its nocturnal effect. A more complex middle section, part of which is in A flat major, adds further distinction to an inspired piece of piano writing. The Nocturne ends with a coda in the major. The second of Opus 27 is in D flat major and finds Chopin, as in the preceding Nocturne, totally sure of himself. Here all is serenity, and the lightly perfumed melody is tastefully decorated and ends with a coda of novel distinction. The two Nocturnes of Opus 32 (1836/7) are of no special interest, though the first, in B major, has a fascinating ending. The A flat major Nocturne that follows makes interesting use of 4/4 against 12/8 in the sections which flank an angry central episode. Very little is known of the C minor Nocturne which exists only as an autograph copy and a sketch. The piece was only ‘discovered’ and published in 1938 and there has been some dispute regarding its date of composition. Some commentators have regarded it, on stylistic grounds, as an early work. However, it now seems fairly certain to have been written in 1837 and Maurice Brown has suggested the piece was originally intended for the Op 32 set but later rejected by Chopin. The first of the pair of Opus 37 Nocturnes is in G minor and in it Chopin includes a chorale-like central section. It was written in 1838. The second, in G major, dates from the following year and is of more interest, particularly for its uncompromising use of modulation; only some fifteen per cent of the piece is in the tonic. The C minor Nocturne, Op 48 No 1, begins in a manner normal for its type, but is transformed in its second section with an imposing chordal episode of considerable grandeur. A further surprise is the final section, in which the opening melody is presented ‘doppio movimento’, thereby completely transforming the subject. The second piece which completes the 1841 Opus 48 is of less importance, and reverses the process of its companion by beginning and ending with an Andante, and having a central ‘molto più lento’ section. Once again in this piece Chopin employs the rhythmic complication of two against three. The next pair of Nocturnes, Opus 55 (1843), are in F minor and E flat minor and are dedicated to Chopin’s Scottish pupil, friend and admirer, Jane Stirling. The first does little to stir the blood though the E flat major example is a fine piece of piano writing. It formally forsakes the usual ternary structure and employs a middle voice to enriching effect. Chopin’s Opus 62 of 1846 contains the last Nocturnes to be published in his lifetime. The first, in B major, is quite remarkable both for its harmonic scheme and for its use of ornamentation. Like its C minor predecessor of Opus 48 it really goes beyond the bounds of what may be expected from a piece titled ‘Nocturne’. Its companion in E major is less distinguished, though the central episode is cunningly introduced and reappears, after the recapitulation, as a coda. Chopin’s Nocturnes provide a fascinating insight into a developing genius. The great Polish master may have been influenced by Hummel’s elegance, by Rossini’s flowering cantilena and Mozart’s artful simplicity, but in the end he must be accounted a true genius of striking originality. Les Nocturnes et les Valses valurent à Chopin ses premiers succès absolus. Mais, autant l’attrait des valses est directement compréhensible en termes d’auditoires de salon, autant le parcours des nocturnes est plus varié. Le titre de ces «pièces de nuit» fut inspiré des œuvres du compositeur et pianiste irlandais John Field (1782–1837), largement distancées par les créations de Chopin, hors le célèbre Nocturne en mi bémol majeur, op.9, d’une similitude quasi embarrassante avec un nocturne de Field sis dans la même tonalité. Les Nocturnes sont enregistrés ici dans l’ordre chronologique de leur composition. Quoique publié posthumément en tant qu’«opus 72», le Nocturne en mi mineur date en réalité de 1827. Comme attendu dans un essai si précoce—Chopin n’avait alors que dix-sept ans—dans une forme nouvelle, la structure et l’invention sont relativement simples, comparées aux grandioses inspirations à venir. Autre œuvre précoce, publiée posthumément en 1875, le Nocturne en ut dièse mineur (1830) est souvent connu comme le «Lento con Gran Espressione», d’après les indications de tempo du compositeur, même si les premiers éditeurs l’intitulèrent «Nocturne» ou «Réminiscence». La pièce, dédiée à la sœur de Chopin, s’ouvre sur un passage de six accords répétés deux fois, avant d’affecter une simple forme A–B–A. Les vingt premières mesures consistent en une mélodie cantabile typiquement chopinesque, sur un accompagnement arpégé. La section centrale est intéressante, et unique dans la production de Chopin, en ce que son matériau repose sur deux œuvres alors tout juste achevées—le Concerto en fa mineur et le lied Zyczenie. Les sources en offrent deux versions. Le premier autographe voit les citations du Concerto jouées par la main droite dans le signe de la mesure originel à 3/4, au double de la valeur de la mesure, jusqu’au 4/4 du Nocturne, qui continue dans la main gauche. Cette pratique polyrythmique «avant-gardiste» fut sans précédent à l’époque de Chopin, qui semble avoir entériné une simplification rythmique dans les copies ulétrieures. Toutefois, Lívia Rév interpète ici la version originale. Puis, l’œuvre s’achève par un retour au matériau initial, quoique dans une forme extrêmement ornée. Les trois premiers Nocturnes publiés, op.9, de Chopin (1830/1) sont dédiés à Madame Camille Pleyel. Camille Pleyel, riche facteur de pianos, invita Chopin à les accompagner, sa femme Marie-Félicité et lui, à Londres, en 1837. Ensemble, ils visitèrent des centres touristiques, tels Hampton Court et Richmond, et se rendirent à Brighton. Marie-Félicité avait la réputation de trouver les hommes irrésistibles et Berlioz en fut un temps amoureux. L’excursion anglaise fut gâchée par le mauvais temps, dont Chopin se plaignit beaucoup, tout en étant fort impressionné par la richesse, l’espace et les arbres recontrés. Le premier Nocturne, op.9, marqué «Larghetto» et délicatement proportionné, instaure immédiatement le style d’écriture mélodique ornée si caractéristique des Nocturnes de Chopin. Le deuxième Nocturne de ce groupe, en mi bémol majeur, est devenu l’une des miniatures les plus célèbres du compositeur, quoique son importance ne dépasse pas, en vérité, le salon. Quant au troisième Nocturne, en si majeur, il est particulièrement remarquable pour l’ornementation délicate de sa mélodie; sa section centrale agitato contraste avec ses paragraphes extrêmes andante. Les trois Nocturnes de l’opus 15 sont dédiés à un ami, le célèbre pianiste Ferdinand Hiller (1811–1885), qui présenta Chopin à Mendelssohn. La première pièce de cet opus (1830/1) révèle déjà l’assurance et l’indépendance grandissantes de Chopin. Fait inhabituel, elle porte un double signe de la mesure (3/4 et 9/8); ses sections extrêmes sont marquées «Andante cantabile», tandis que sa section centrale, tumultueuse, est marquée «con fuoco». Chopin atteint à une humeur merveilleusement fraîche dans les sections andante—d’où un contraste considérable avec le cours voluptueux du Nocturne suivant, en fa dièse majeur, composé à la même époque, dont les sections extrêmes larghetto, dotées d’un «doppio movimento» formidablement passionné, recréent une atmosphère de salon parfumée. La dernière pièce (1833) de ce corpus, en sol mineur et marquée «Lento», est une œuvre étrange, pourvue d’un choral central extrêmement simple. Avec les deux Nocturnes de l’opus 27 (1835), dédiés à Madame la Comtesse d’Appony, Chopin atteignit à un nouveau niveau d’inspiration. L’atmosphère de la première pièce—œuvre délicatement mystérieuse, sise en ut dièse mineur et marquée «Larghetto»—est instaurée dès la troisième mesure par une équivoque majeur-mineur, rehaussée, dans les sections extrêmes, par une basse ample, ajoutant à l’effet nocturne. Une section centrale plus complexe, dont une partie est en la bémol majeur, insuffle un supplément de distinction à cette pièce d’une écriture pianistique inspirée, qui s’achève sur une coda en majeur. La seconde pièce de l’opus 27, en ré bémol majeur, trouve Chopin entièrement sûr de lui, comme dans le précédent Nocturne. Tout est sérénité et la mélodie, légèrement parfumée et ornée avec goût, se conclut sur une coda empreinte d’une distinction nouvelle. Les deux Nocturnes de l’opus 32 (1836/7) ne présentent aucun intérêt particulier, même si le premier, en si majeur, possède une fin fascinante. Le second, en la bémol majeur fait un usage intéressant de la mesure à 4/4, contre celle à 12/8, dans les sections flanquant un épisode central furieux. Nous savons très peu de choses du Nocturne en ut mineur, qui n’existe que sous les formes de copie autographe et d’esquisse. La pièce ne fut découverte et publiée qu’en 1938, et sa date de composition fut sujette à quelque controverse. Sur le plan stylistique, certains commentateurs la considérèrent comme une œuvre de jeunesse. Il semble toutefois presque certain qu’elle ait été écrite en 1837; Maurice Brown suggéra qu’elle fut d’abord destinée à l’opus 32, puis rejetée par le compositeur. Le premier des deux Nocturnes de l’opus 37, en sol mineur (1838), inclut une section centrale de type choral. Le second, en sol majeur (1839), présente plus d’intérêt, surtout pour son usage inflexible de la modulation; seuls quinze pour cent de la pièce sont sis dans la tonique. Le Nocturne en ut mineur, op.48 no1, débute normalement avant d’être transformé, dans sa seconde section, par un imposant épisode en accords, d’une splendeur considérable. La section finale est également surprenante, qui présente la mélodie initiale «doppio movimento», transformant complètement le sujet. La seconde pièce de l’opus 48 (1841), de moindre importance, fait l’inverse du premier Nocturne, puisqu’elle débute et s’achève sur un Andante, avec une section centrale «molto più lento». Chopin y recourt de nouveau à la complication rythmique de «deux contre trois». Les deux Nocturnes, opus 55 (1843), en fa mineur et en mi bémol mineur, sont dédiés à l’élève, amie et admiratrice écossaise de Chopin, Jane Stirling. La première de ces pièces ne s’affaire guère à réveiller l’enthousiasme, cependant que la seconde est une belle pièce d’écriture pianistique, qui délaisse l’habituelle structure ternaire et emploie une voix centrale pour enrichir l’effet. L’opus 62 (1846) contient les derniers Nocturnes publiés du vivant de Chopin. Le premier, en si majeur, est tout à fait remarquable tant pour son schéma harmonique que pour son utilisation de l’ornementation. Comme le Nocturne en ut mineur de l’op.48, il outrepasse véritablement les limites de ce que l’on pourrait attendre d’une pièce intitulée «Nocturne». Le second Nocturne, en mi majeur, est moins distingué, en dépit d’une introduction astucieuse de l’épisode central qui reparaît, après la reprise, en tant que coda. Les Nocturnes de Chopin nous offrent un regard fascinant sur un génie en développement. Et, quelles que soient les influences qu’il ait pu subir—l’élégance de Hummel, la cantilène fleurie de Rossini et la simplicité maîtrisée de Mozart—, le grand maître polonais doit, en définitive, être considéré comme un véritable génie, d’une originalité saisissante. Die ersten Kompositionen, die Chopin regelrechten Erfolg bescherten, waren seine Notturnos und Walzer. Während man bei den Walzern gleich im Takt mitwippte, was sich auch in bezug auf das Salonpublikum verständlicherweise direkt auswirkte, so stellen die Notturnos etwas viel Reichhaltigeres dar. Den Titel dieser „Nachtstücke“ entlieh er sich von den Werken des irischen Komponisten und Pianisten John Field (1782–1837). Die Notturnos Chopins lassen zwar jene des Iren ganz klar hinter sich, das berühmte Notturno in Es aus Chopins Opus 9 weist aber fast peinliche Ähnlichkeiten mit einem in der gleichen Tonart verfaßten Werk Fields auf. Die Notturnos sind hier in der chronologischen Reihenfolge ihrer Komposition zusammengestellt. Das erst nach seinem Tode als „Opus 72“ veröffentlichte Notturno in e-Moll datiert eigentlich aus dem Jahr 1827, als der Komponist siebzehn Jahre alt war. Wie man fast schon von einem solch frühen Versuch dieser neuen Form erwarten kann, sind Aufbau und Ideenreichtum im Vergleich zu den grandiosen, späteren Inspirationen relativ simpel. Ein anderes frühes Werk, das 1875 posthum veröffentlichte Notturno in cis-Moll von 1830, ist nach Chopins Tempoangaben weithin als „Lento con Gran Espressione“ bekannt, obwohl es dessen frühere Verleger unterschiedlich als „Notturno“ bzw. „Remineszenz“ betitelten. Das Stück war der Schwester Chopins gewidmet. Es beginnt mit einer Passage von sechs Akkorden, die sich zweimal wiederholen, und folgt daraufhin einem einfachen A–B–A-Schema. Die ersten zwanzig Takte bestehen aus einer für Chopin charakteristischen, gesangvollen Melodie mit arpeggierter Begleitung. Der Mittelteil von Chopins Produktion ist insofern interessant und einzigartig, als daß das Material auf zwei gerade von ihm fertiggestellten Werken basiert—dem Konzert in f-Moll und dem Lied Zyczenie. Von diesem Abschnitt existieren zwei Versionen in den Quellen. Im ersten Autograph werden die Zitate aus dem Konzert mit der rechten Hand in ihrer ursprünglichen 3/4-Takt-Signatur im doppelten Takttempo zur 4/4-Takt-Signatur des Notturno gespielt, welches mit der linken Hand fortgesetzt wird. Diese avantgardistische polyrhythmische Technik kannte man zur Zeit Chopins nicht; in späteren Fassungen scheint er wohl einer rhythmischen Simplifizierung zugestimmt zu haben. Bei dieser Aufnahme allerdings handelt es sich um das Original, das von Lívia Rév gespielt wird. Das Werk schließt mit einer Rückkehr zum Eröffnungsmaterial ab, diesmal jedoch in sehr ausgeschmückter Gestalt. Die ersten drei veröffentlichten Notturnos Chopins, op. 9, wurden Madame Camille Pleyel gewidmet und gehen auf die Jahre 1830/1 zurück. Camille Pleyel war ein wohlhabender Klavierhersteller, der Chopin dazu einlud, ihn und seine Frau, Marie-Felicité, 1837 nach London zu begleiten. Sie besuchten touristische Ziele wie Hampton Court und Richmond, und statteten auch Brighton einen Besuch ab. Marie-Felicité hatte den Ruf, keinem Mann widerstehen zu können, und auch Berlioz verliebte sich einst in sie. Die Reise nach England wurde durch schlechtes Wetter beeinträchtigt, über das sich Chopin ziemlich beklagte; er zeigte sich aber auch sehr beeindruckt vom Wohlstand, dem vielen Platz und den Bäumen, die er sah. Das erste, als „Larghetto“ gekennzeichnete, Opus-9-Notturno ist ein herrlich proportioniertes Stück, das umgehend den Stil ausgeschmückter, melodischer Komposition unter Beweis stellt, der für Chopins Notturno ein so wesentliches Merkmal ist. Das zweite dieser Gruppe ist in Es-Dur gehalten und wurde zu einer der bekanntesten Miniaturen dieses Komponisten, wenn auch seine Bedeutung kaum über seine Verwendung im Salon hinausgeht. Das dritte Notturno, in H-Dur, ist insbesondere aufgrund der feinen Ausschmückung seiner Melodie bemerkenswert. Der zentrale Agitatoabschnitt steht im Gegensatz zur Andante der Absätze zu Beginn und Ende. Die drei Notturnos, die das Opus 15 ergeben, ehren Ferdinand Hiller (1811–1885), dem das Stück gewidmet ist. Hiller, ein gefeierter Pianist, war ein Freund Chopins, der ihn mit Mendelssohn bekannt machte. Das erste Notturno aus dem Opus 15 stammt aus den Jahren 1830/1 und läßt bereits Chopins wachsende Selbstsicherheit und Unabhängigkeit erkennen. Ungewöhnlicherweise verfügt es über eine Doppelsignatur im 3/4- und im 9/8-Takt, wobei seine Anfangs- und Endabschnitte als „Andante cantabile“ und sein stürmischer Mittelteil als „con fuoco“ gekennzeichnet sind. Chopin schafft in den Andanteabschnitten eine wunderbar kühle Stimmung, was einen merklichen Kontrast zum sinnlichen Tenor des darauffolgenden Fis-Dur-Notturnos darstellt, das er zur gleichen Zeit komponierte. Hierbei wird mit den äußeren Larghetto-Abschnitten, welche ein „doppio movimiento“ enormer Leidenschaft umschließen, die schicke Salonatmosphäre nachempfunden. Das letzte aus dieser Reihe stammt von 1833 und ist ein merkwürdiges Stück, das einen zentralen Choral extremer Simplizität enthält. Es ist in g-Moll gehalten und als „Lento“ gekennzeichnet. Mit den beiden Notturnos des Opus 27 (1835) erreicht Chopin eine völlig neues Niveau der Inspiration. Beide sind Madame la Comtesse d’Appony gewidmet, wobei das erstere in cis-Moll als „Larghetto“ gekennzeichnet ist. Bereits ab dem dritten Takt bestimmt eine Unentschiedenheit zwischen Dur und Moll die Atmosphäre dieses herrlich rätselhaften Stückes, das in seinen äußeren Abschnitten durch einen umfangreichen Baß, der zur nächtlichen Stimmung beiträgt, noch verstärkt wird. Ein komplexerer Mittelteil, der teilweise in As-Dur geschrieben ist, trägt zusätzlich zur Klasse dieser inspirierten Klavierkomposition bei. Das Notturno schließt mit einer Koda in Dur. Das zweite Stück aus dem Opus 27 ist in Des-Dur und zeigt, wie bereits im vorangegangenen Notturno, Chopins Selbstvertrauen. Das Stück strahlt durchgehend eine friedvolle Gelassenheit aus, die leicht parfümierte Melodie ist geschmackvoll ausgeschmückt und endet mit einer Koda von edler Distinktion. Die beiden Notturnos aus dem Opus 32 (1836/7) sind nicht von besonderem Interesse, obgleich das erste, in H-Dur, über einen faszinierenden Schluß verfügt. Im darauffolgenden As-Dur-Notturno wird in den, einen bedrohlichen Mittelteil einrahmenden, Abschnitten auf interessante Weise neben einem 4/4-Takt Gebrauch von einem 12/8-Takt gemacht. Das Notturno in c-Moll ist fast gänzlich unbekannt, und es existieren davon lediglich eine handschriftliche Version und ein Entwurf. Erst im Jahre 1938 wurde das Stück „entdeckt“ und veröffentlicht; der Zeitpunkt seiner Komposition ist ein wenig umstritten. Einige Kritiker betrachteten es aufgrund seiner stilistischen Mittel als ein frühes Werk. Inzwischen ist es aber so gut wie erwiesen, daß es 1837 geschrieben wurde; Maurice Brown glaubt, daß das Stück ursprünglich als Beitrag zu Opus 32 bestimmt war, aber später von Chopin verworfen wurde. Beim in g-Moll gehaltenem ersten der beiden Opus-37-Notturnos verwendet Chopin einen choralartigen Mittelabschnitt. Dieses Stück entstand im Jahre 1838. Das zweite, in G-Dur, stammt aus dem folgenden Jahr und ist von größerem Interesse, insbesondere aufgrund seiner kompromißlosen Verwendung der Modulation: Nur etwa fünfzehn Prozent des Stückes ist in der Tonika. Die nächsten beiden Notturnos, Opus 55 (1843), in f-Moll bzw. Es-Dur, sind einer Freundin und Verehrerin des Komponisten gewidmet, Jane Stirling, einer von Chopins schottischen Schülerinnen. Das erste Notturno ist nicht gerade mitreißend; das Stück in es-Moll hingegen ist ein gutes Beispiel für eine großartige Klavierkomposition. Dabei wird die übliche dreiteilige Struktur formell verlassen, und eine sich bereichernd auswirkende Mittelstimme kommt zum Einsatz. Chopins Opus 62 von 1846 umfaßt die letzten Notturnos, die zu seinen Lebzeiten veröffentlicht wurden. Das erste, in H-Dur, ist besonders hinsichtlich seines harmonischen Schemas und der Verwendung von Ausschmückungen bemerkenswert. Wie bereits sein Vorgänger in c-Moll aus dem Opus 48, so werden auch hier die Erwartungen, die man von einem Stück hat, das als „Notturno“ bezeichnet wird, bei weitem übertroffen. Sein Pendant in E-Dur ist von nicht ganz so hoher Qualität, wenn auch das zentrale Zwischenspiel geschickt eingefädelt wird und nach der Reprise als Koda wiedererscheint. Chopins Notturnos bilden einen faszinierenden Einblick in das sich entwickelnde Genie eines Komponisten. Der große polnische Meister mag vielleicht von Hummels Eleganz, Rossinis blühender Kantilene und Mozarts kunstvoller Simplizität beeinflußt gewesen sein, doch letztendlich muß er als wahres Genie mit einer verblüffenden Originalität betrachtet werden.